Sacketts Brook, Putney, VT photo by putneypics. Used under Creative Commons license. 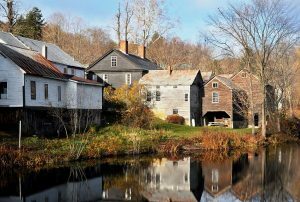 Located just north of Brattleboro, Vermont, the small town of Putney rests along the Connecticut River, sharing a border with New Hampshire to the east. Despite being a relatively small town, with a population of just over 2,700, Putney has long had a well-known reputation for its unique schools and educators, community of artists, family farms, and beautiful landscape. Putney’s town center, known as the Putney Village Historic District, is listed on the National Register of Historic Places, and for good reason. Many of the farmhouses, churches, and other buildings in Putney were built over 150 years ago and are still fully functional and very well cared for. Now, the town center is home to several restaurants that offer local ingredients from the many nearby farms in addition to some great small shops with offerings ranging from specialty jewelry to antiques. Venues like the Next Stage Arts Project, Sandglass Theater, and Yellow Barn are also located in or near Putney’s downtown area, and all three play host to an endless variety of live performances from artists around the country. Putney is home to The Greenwood School, a college preparatory school for boys, and Landmark College, both of which cater to students that learn differently or have specific learning disabilities. Putney is also home to The Putney School, a non-traditional high school that emphasizes progressive educational programs and project-based learning. And for students between pre-kindergarten and 8th grade, the Putney Central School is the town’s small public school. For those that enjoy outdoor activities, Putney is perfectly situated for year-round entertainment. Miles of beautiful trails for hiking and biking are maintained by groups like the Putney Mountain Association and Windmill Hill Pinnacle Association, the area is known for its many secluded swimming holes, the Connecticut River to the town’s east offers great opportunities for boating, and winter activities like skiing and snowshoeing are so easy to do closeby. Putney is a truly idyllic town that visitors are enthralled by as soon as they get there. It should come as no surprise that getting to know the area and what the community has to offer can often entice those visiting to eventually make Putney their home.